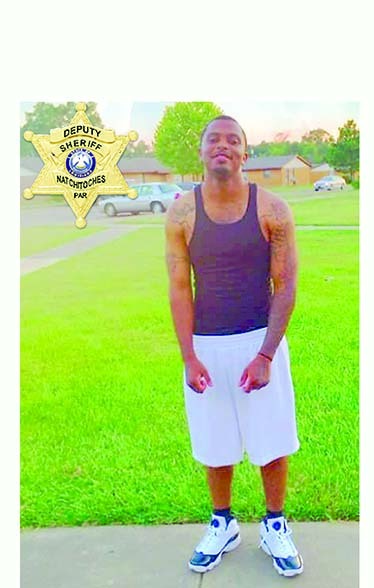 Natchitoches Parish Sheriff’s deputies are looking for a Natchitoches man wanted on several criminal charges in connection with a disturbance that led to the kidnapping of a Natchitoches woman Nov. 1. Deputies responded to reports of a disturbance Nov. 4 at 9:48 p.m. in the 200 block of Michelle Drive in the Payne Sub-Division near Natchitoches. Deputies learned a female had been taken against her will from the residence by a former acquaintance identified as JaDarrius Deon Wilson. Wilson and the victim left the residence reportedly traveling in a black 2004 GMC Yukon. A BOLO (Be on the Lookout) message was issued on the vehicle to local law enforcement agencies and officers. Detectives also responded to assist. At 11:08 p.m., a detective observed the suspect vehicle on La. Hwy 6 East in the Grand Ecore area. When the detective attempted to stop the vehicle, Wilson led deputies on a pursuit on the north Natchitoches Bypass then onto Brezealle Springs Road, traveling through several streets in the City of Natchitoches and crashing into another vehicle at the intersection of Theophille and Dixie Streets. Wilson exited the vehicle and fled on foot. Deputies recovered the victim unharmed. Deputies and Natchitoches Police searched the area but were unable to locate Wilson. Detectives continued the investigation by interviewing the victim and witnesses. Detectives obtained sufficient evidence and probable cause to obtain criminal warrants for Wilson, 24, b/m, 6 feet, 1 inch tall weighing 165 pounds with black hair, brown eyes and multiple tattoos on his arms. He is wanted by the NPSO for Simple Kidnapping, 2-counts of Violation of a Protective Order, Simple Criminal Damage to Property, Domestic Abuse Battery, Theft of a Motor Vehicle, Aggravated Flight from an Officer, Aggravated Criminal Damage to Property and multiple traffic offenses. Wilson, who has ties to the Coushatta area in Red River Parish, is a prior felon and considered dangerous. If you see Wilson, do not approach him, contact your local law enforcement immediately or the Natchitoches Parish Sheriff’s Office at 318-352-6432. Wilson has been entered in the National Crime Information Center as a Wanted Person. NPSO Case Agent: Detective Jared Kilpatrick, 318-357-7830 or Sgt. Ronnie Ross, 318-352-6432. Previous article‘J.R.’ JUNUS O. RACHAL, JR.